Vo Trong Nghia Architects have stunned us again with the reveal of their latest design: a lush tree-topped FPT University campus building in Ho Chi Minh City. 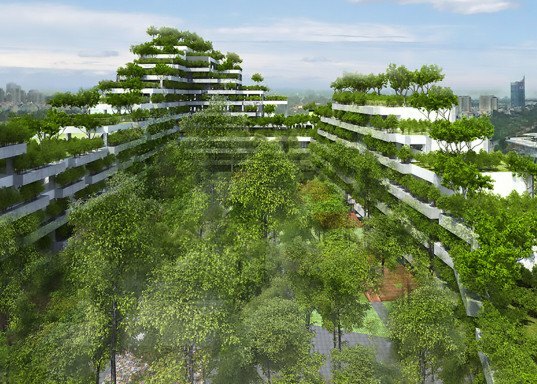 The verdant project, which appears to grow a tree on every balcony, was created in the same environmentally friendly style that defines the Vietnamese architecture firm’s work. The recently unveiled project is Vo Trong Nghia Architects’ second commission with the FPT University Campus—the architecture firm previously designed another one of the technical university’s campuses located near Hanoi. Surrounded by skyscrapers, the 22,500-square-meter Ho Chi Minh City FPT University campus will serve as a green oasis in an urban setting. The campus building takes on the form of an undulating forested mountain that encloses a green central courtyard. The lush landscaping in the courtyard appears to grow outwards from the center and overtake the building’s staggered concrete floors and balconies. “To engage the city in a different way, FPT University appears as an undulating forested mountain growing out of the city of concrete and brick,” said Vo Trong Nghia Architects to Dezeen. “This form creates more greenery than is destroyed, counteracting environmental stress and providing the city with a new icon for sustainability.” The greenery, numerous balconies, and courtyard pools are expected to improve air quality and reduce the campus’ dependence on air conditioning. 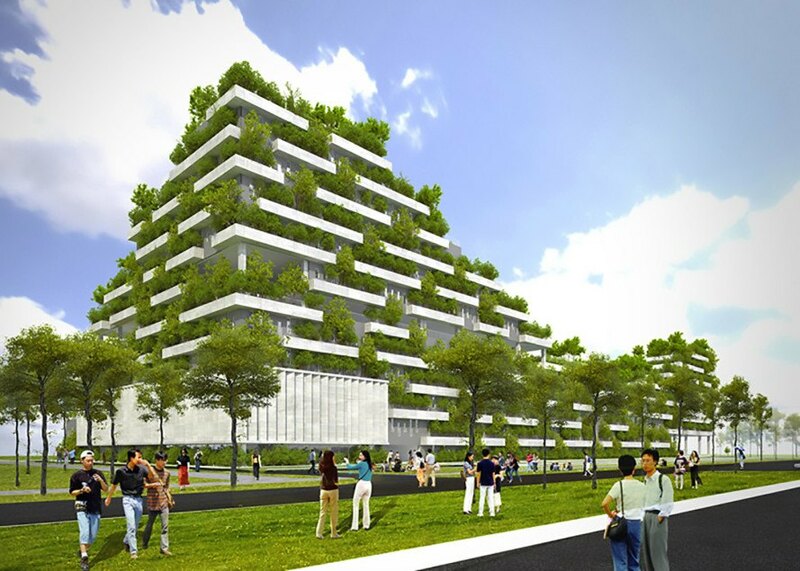 Surrounded by skyscrapers, the 22,500-square-meter Ho Chi Minh City FPT University campus will serve as a green oasis in an urban setting. The campus building takes on the form of an undulating forested mountain that encloses a green central courtyard. The lush landscaping in the courtyard appears to grow outwards from the center and overtake the building’s staggered concrete floors and balconies. "To engage the city in a different way, FPT University appears as an undulating forested mountain growing out of the city of concrete and brick,” said Vo Trong Nghia Architects to Dezeen. “This form creates more greenery than is destroyed, counteracting environmental stress and providing the city with a new icon for sustainability." The greenery, numerous balconies, and courtyard pools are expected to improve air quality and reduce the campus’ dependence on air conditioning. The campus can accommodate around 5,000 students.